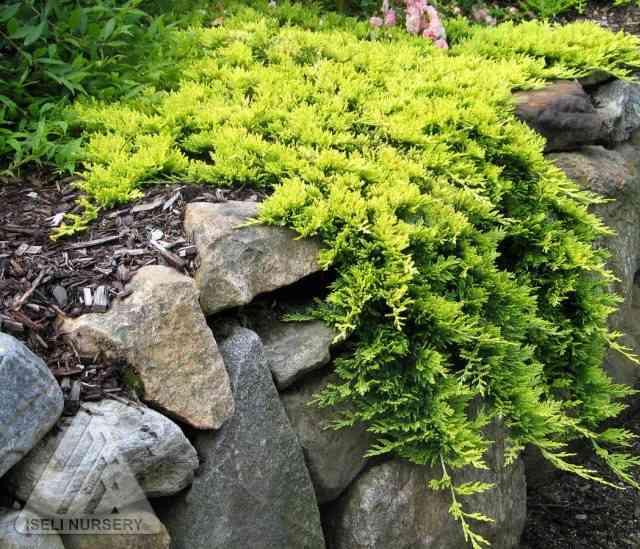 Bright, golden-yellow foliage for summer and rich, burgundy plum for winter give this extremely flat, ground-hugging juniper long-term garden interest. Discovered at Iseli Nursery in 1982 as a sport on 'Wiltoni', 'Motherlode' performs admirably in full or partial sun. It grows slowly but spreads to make a glowing carpet of gold. Let it cascade over a bank, define a mound, complement stonework or mass it as a groundcover. Juniper 'Motherlode' is very easy to grow in slightly acidic, well drained soil in full sun to partial sun. 'Motherlode' is tolerant of hot, dry conditions once established. Junipers will not tolerate wet sites. Be sure to leave enough space for this juniper to spread naturally because eventually it does become a sizeable plant.